Are you ready for something new? I am. It's time to have a little FUN in the NICU. Wait, did I just write that? 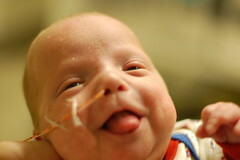 Can you really put "NICU" and "fun" in a sentence together? Yes, I did. And, yes you can. At least, that's my goal. Don't run away yet, I promise I'm not crazy. As a NICU nurse, I know full well that the NICU is not a fun place. 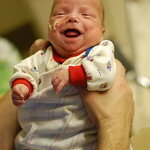 In fact, you could ask any parent to describe the NICU, and the one word you'll probably NEVER HEAR is "fun." You'll more likely hear words such as "sad" and "depressing," "hell" and "scary" and "hopeless." So why am I writing about it then? Because it is clear that fun, even just a little bit of it, is desperately missing when your baby is in the NICU. Every parent looks forward to enjoying their baby. It's natural, and it doesn't stop just because you have a NICU baby.You want to have permission to smile, to enjoy parenthood, to be delighted and joyful. I believe we can make it happen, if even for small moments of time, when your baby is in the NICU. I really do. I've seen it first hand. In spite of the most difficult times, we can seek and embrace pockets of joy, we can appreciate morsels of happiness. I believe parents and staff and families can cultivate it, if we allow ourselves to do so. at any opportunity you can find. Give yourself permission to have a little fun with your baby. Let's not pretend it's all fun, that would be insensitive and unrealistic. To say that the NICU is challenging is an understatement. It's nearly unbearable for many families. But that doesn't mean you still can't have some cheer. If fact, I think it's extremely important, for your mental health, your relationship with your partner and your family and particularly your baby, that you look for the positive and make the very best of this situation. So find something to celebrate and enjoy today. Try it. 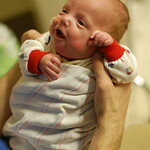 Next, lets set aside the struggle that is the NICU, just temporarily, and get thinking - how CAN we make the NICU fun? This summer I've been brainstorming. For starters, I've put together a list of 11 ways to have fun in the NICU. Next, I'm hosting an awesome giveaway, with some fantastic & adorable prizes, to make one lucky winner's NICU days truly more fun. Stay tuned, it's gonna be great. But I can use your help. Would YOU leave YOUR ideas, share your experiences of fun in the NICU? Email me directly, or leave them as comments here. And then keep checking back, better yet subscribe, so you can keep up with all the fun ideas we can dream up together for your NICU journey. Are you with me on this journey? I hope so. I believe it's going to be a fun one.